...Span all stages of natural life and all important moments of the Christian life. 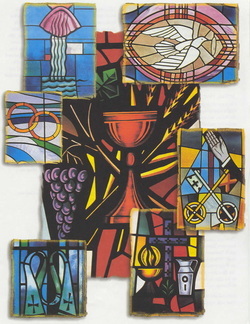 The visible reality we see in the Sacraments is their outward expression or signs (bread, wine, oil, water...)and the ways in which they are administered and received. The invisible reality we cannot "see" is God's grace, His gracious initiative in redeeming us through the death and Resurrection of His Son. His initiative is called grace because it is the free and loving gift by which He offers people a share in His life and shows us His favor and will for our salvation. Our response to the grace of God's initiative is itself a grace or gift from God by which we can imitate Christ in our daily lives. Service of Communion (Marriage and Holy Orders). Through the Sacraments, God shares His holiness with us so that we, in turn, can make the world holier. The Latin word sacramentum means "a sign of the sacred." God's saving presences is experienced through these seven Sacraments.